We’d like to like the profiterole at Inci Pastanesi on Istiklal. And we’d like to believe their claim that the profiterole was invented on the premises in the 1940’s. But we like Inci for non-culinary reasons. This old school Beyoglu pastry shop has been spooning out cream puffs covered in chocolate goop for 70 years with a respect for tradition and a refreshing contempt for the latest trends in interior design. For better or worse, it is an institution. Today, this culinary landmark is one of the last holdouts in the historic Cercle D’Orient block, defying an eviction notice from one of the most powerful developers in the country. The grand building, which is also home to the recently shuttered Emek cinema, one of the last great movie halls in Istanbul, is slated to become a shopping center. That would put it next door to another shopping mall that rising on Istiklal, which itself is already evolving into a kind of elongated, open-air mall. More shopping vs. Inci’s profiterole? We know where we come out on that one. We only wish the grand poobahs who are in charge of Beyoglu’s “urban transformation” felt the same way we do. Inci is collecting signatures to save the home of the profiterole, but the staff admits its days are most likely numbered. 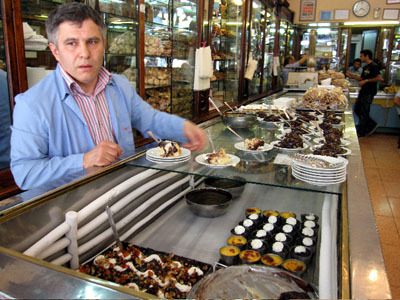 Stop in and sign the petition, if not for a profiterole then for what might be a final glimpse of old Beyoglu. Some hopeful news — a lawyer friend tells us a court has issued an order for any work on the building to be stopped. Let’s see what happens. However, Inci is a part of Beyoglu’s old heritage and i think it’s not what used to be. Home of the profiteroach!?!? We’ll have to check things out. Well to be honest, I’ve always thought Inci was one of the many place that has rested on little but its laurels for many years now, producing a pasty, tasteless product that people continue to go into ecstasies about. Maybe it really was good once, but I think the cheapening of products in so many of Istanbul’s landmark venues, and their being replaced by shopping malls and foreign chains, is all part of the same phenomenon – the sacrifice of everything for the sake of money. It will all be McBeyoglu before long. in May 2012 they were still open and the profiteroles were delicious. loved the place. the decor is perfect! I visited Inci in 2003 as an American tourist, having just graduated from my university. It is one of many fond memories from my time in Istanbul. I intend to return one day, perhaps even to call Istanbul ‘home’, and I hope to find Inci still open. With all the wonderful history celebrated in Istanbul, let’s save this sweet memory for other generations to enjoy. Anyone have a contact to your Department of Tourism? I’d be happy to put in a good word.